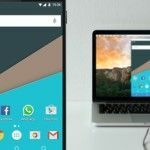 By the way, every Samsung user should know how to use Bixby What Is Bixby? 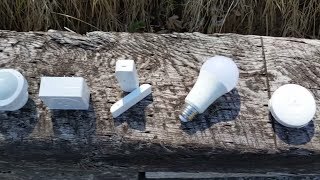 And How Do You Use It? What Is Bixby? 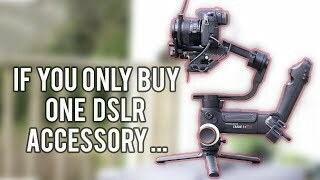 And How Do You Use It? If you have a Samsung phone, check out everything Bixby can do. 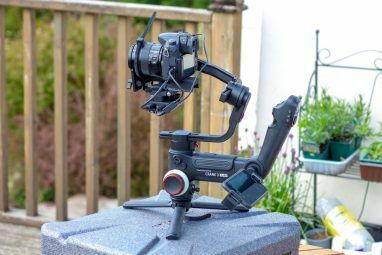 Here's a look at its most useful features. Read More too. It’s an analog-only watch face that has an stylish industrial feel, ideal for anyone who is into gadgetry. 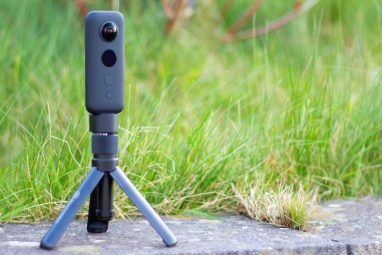 Speaking of which, check out the best tech gifts for geeks The Best Tech Gifts for Geeks The Best Tech Gifts for Geeks Tech gifts for geeks can be hard to find. That's why we've rounded up the best tablets, e-readers, fitness trackers, and more! 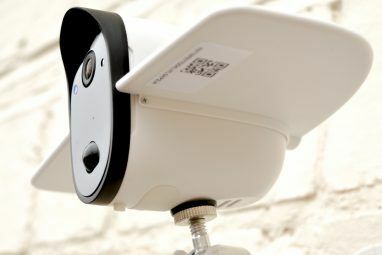 Read More if you’re shopping for a gadget fan. 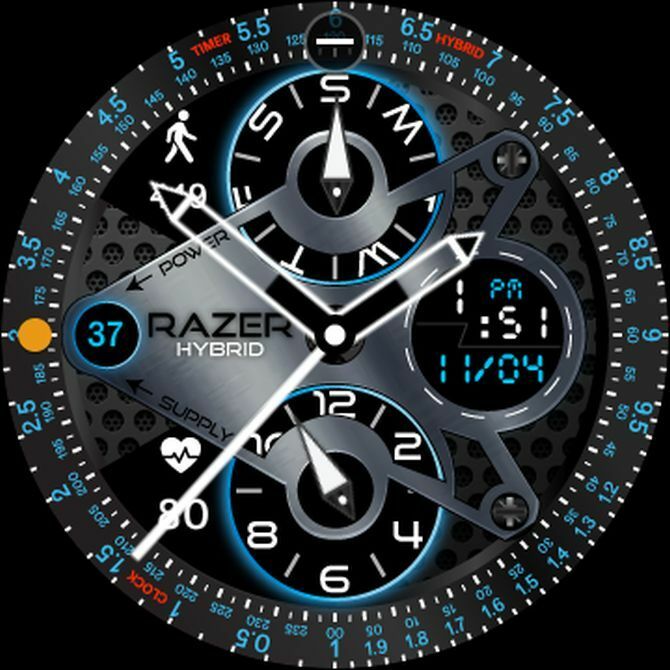 Razer: This watch face is like having several in one, because you can double-tap on it to change the color theme. 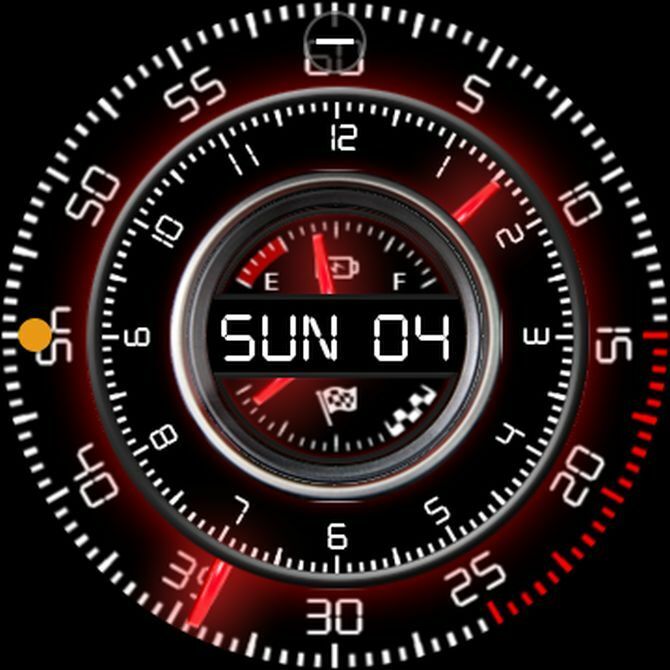 Like most other MikhailStyle watch faces, time is in analog and digital format. 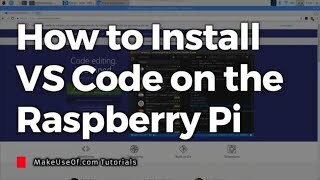 It displays steps and heart rate. Hour and weekday are analog dials. The background is steampunk-inspired, just like the many steampunk video games available Can't Wait for The Order: 1886? Play These Other Steampunk Games Instead Can't Wait for The Order: 1886? Play These Other Steampunk Games Instead Steampunk is a recognizable aesthetic characterized by steam power and Victorian fashion. Love the look? Play these games! Read More . 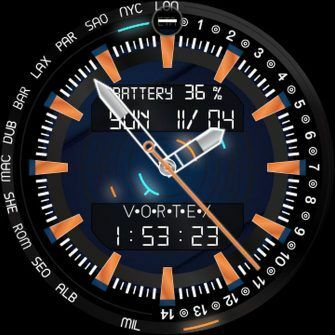 This Samsung Gear watch face created by Yahya Alkhatib is one of the most creative free faces you’ll find in the gallery. It has a racecar dashboard theme, with glowing dials from the outer minutes ring to the inner section. The inner section shows the date in digital format. 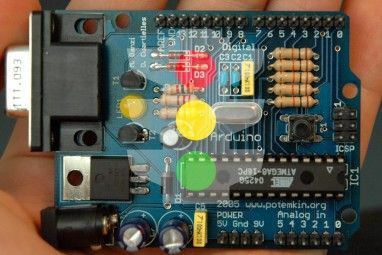 Above it is a fuel gauge for battery life; below is a checkered flag gauge for daily steps. 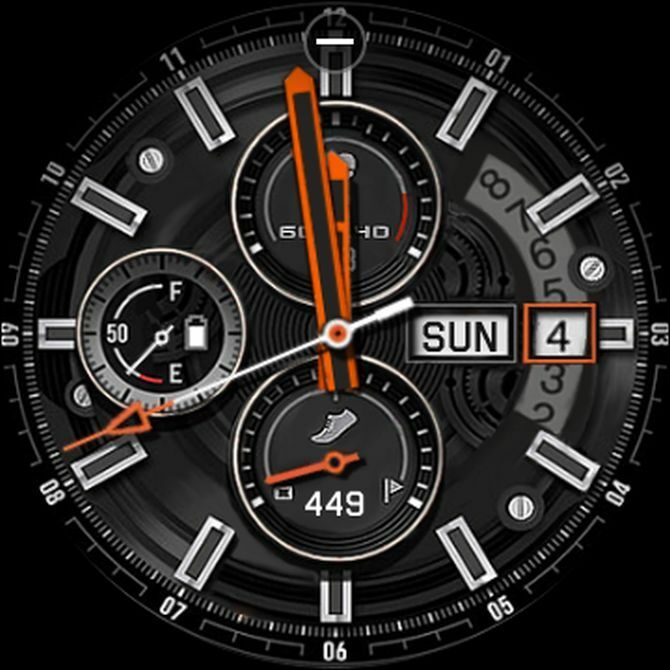 The highlight of this watch face is that when you tilt it at any angle, it displays in a cool 3D effect. 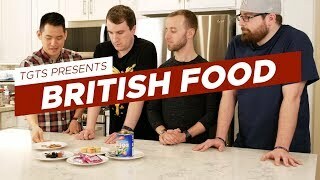 You can disable this if you don’t like it. 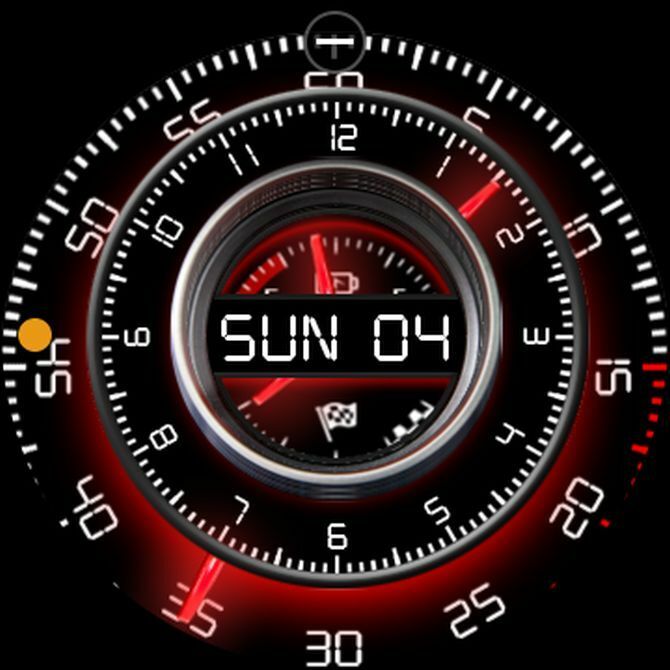 Deep Grey is a beautiful yet simple watch face also designed by Italo Sovena. 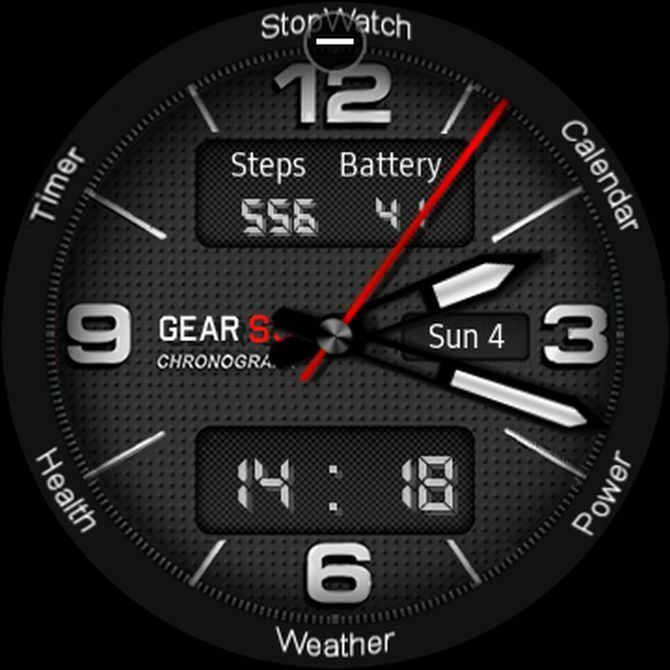 The name describes the face perfectly: it’s a deep gray theme with basic watch information on display. 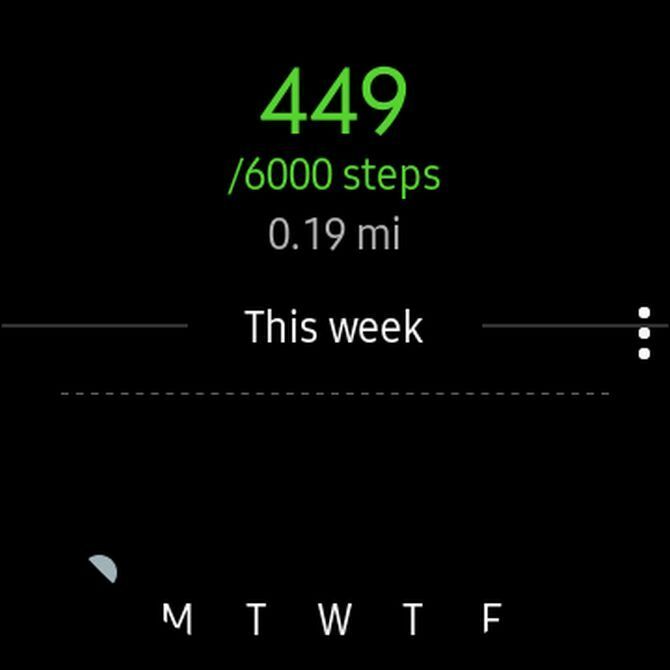 Time is both analog and digital, while the top of the face shows total steps for the day and battery level. 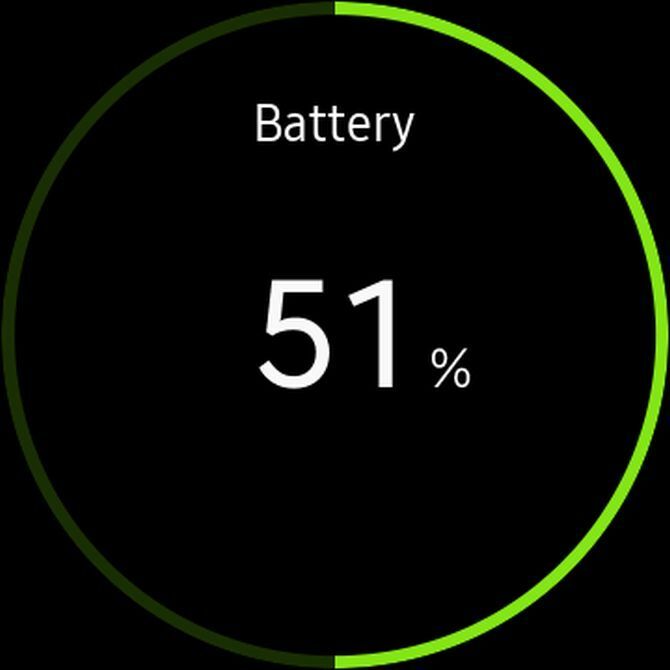 Around the outer edge of the watch face there are default app links to weather, calendar, health, and battery power. 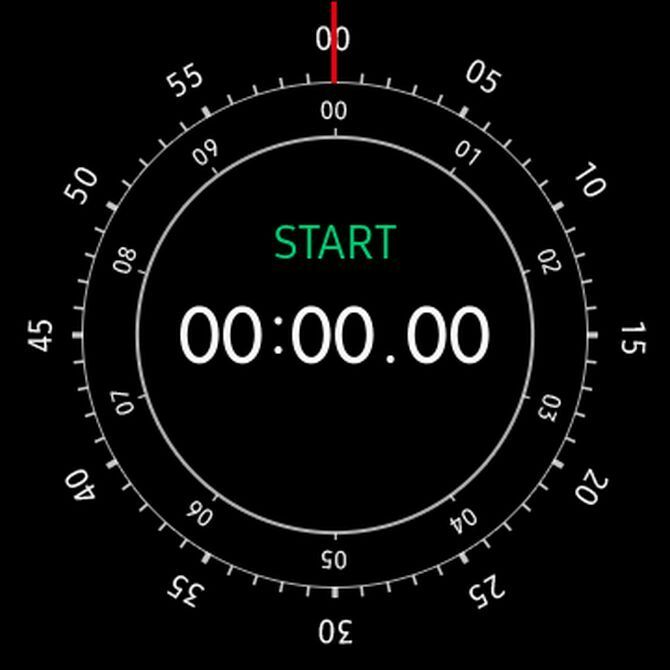 If you want to use the timer and stopwatch, you’ll need to install those Samsung apps to your phone as well. 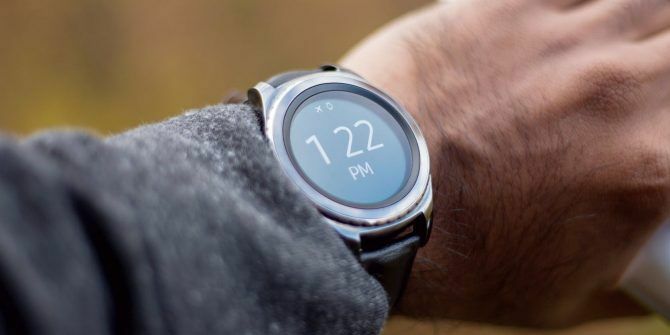 If you’re the kind of person who’s always checking the weather, then this is the Samsung Gear watch face for you. 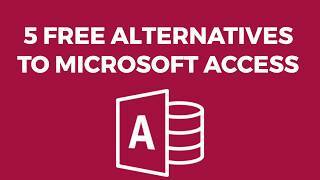 It’s a stunning option that provides you with a lot of information in a small space. You need to download weather information manually, and you’re limited to only one theme color with the basic app. 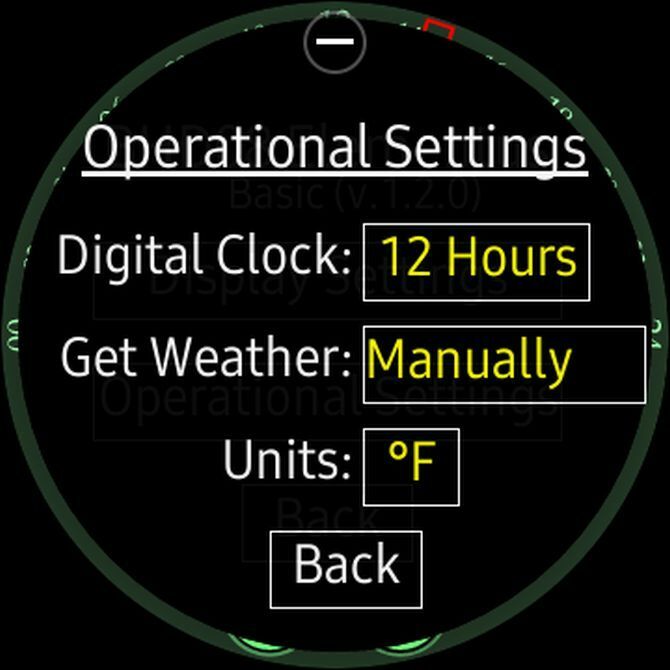 The premium version lets you set an automatic weather update every few hours, and you can choose from a selection of themes. 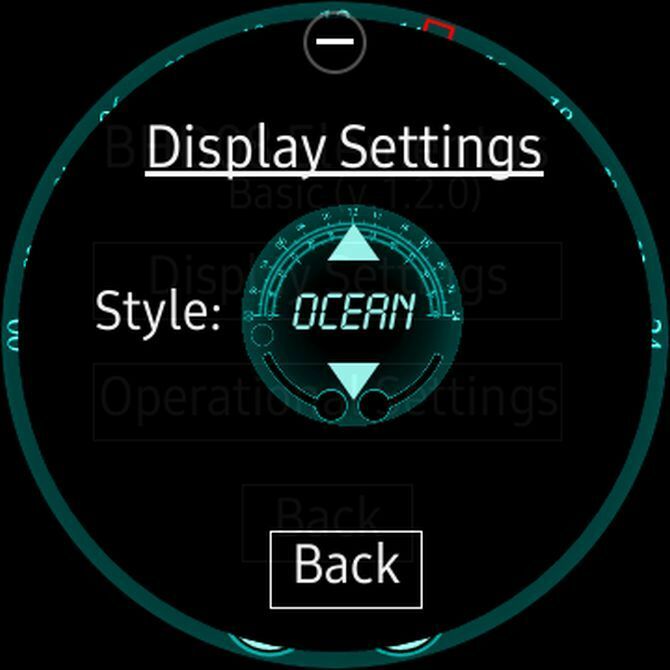 If you’re more into Samsung Gear watch faces with a sci-fi theme, there are lots to choose from. 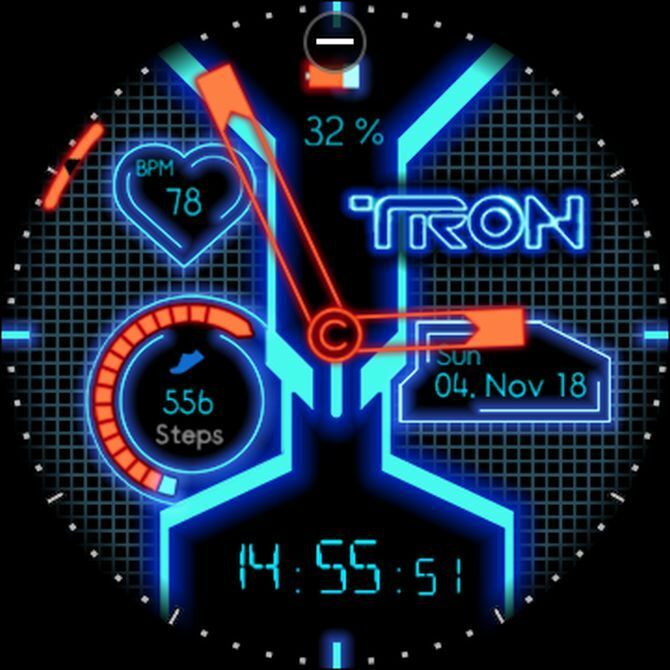 Tron: Created by Nico Gehrke, this innovative watch face will make Tron fans smile. The watch face displays battery level, heart rate, steps, time, weekday, and date all in digital format. 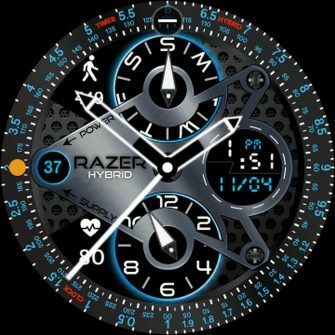 It’s all packed within a neat Tron theme underneath the analog watch hands. 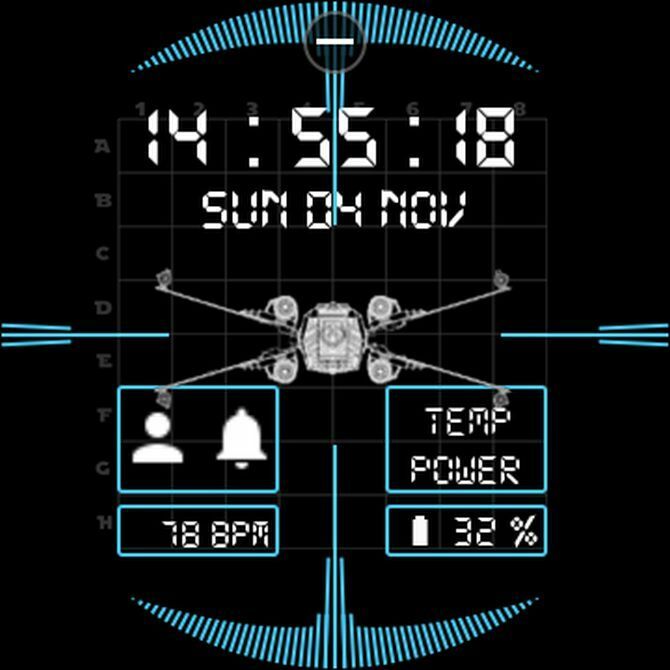 X-wing digital: This theme by Dimitris Zafiris is perfect for fans of Star Wars (have you downloaded the best Star Wars apps 7 Mobile Apps Every Star Wars Fan Needs 7 Mobile Apps Every Star Wars Fan Needs Love Star Wars? You need these awesome Star Wars apps for your iPhone or Android device that provide wallpapers, games, and more. 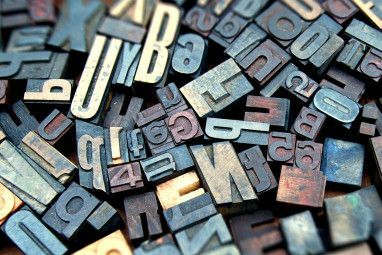 Read More ?). It features an animated X-wing fighter moving around inside the crosshairs. 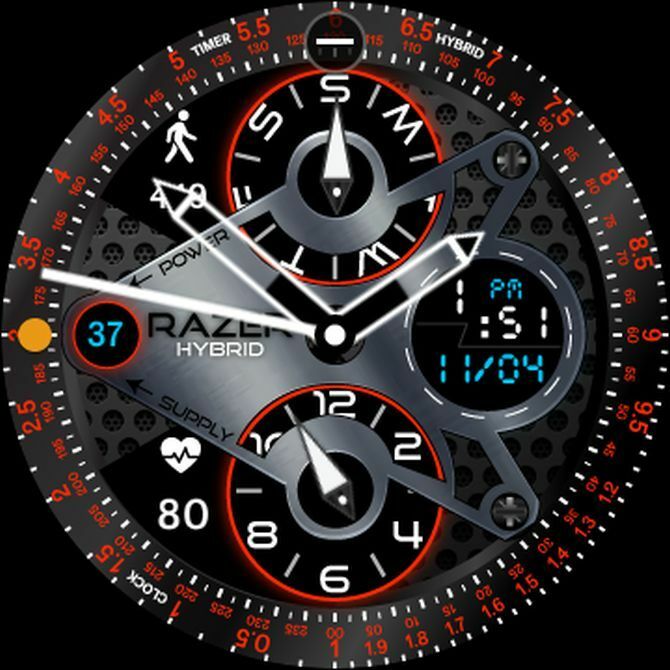 The watch face shows digital time and date at the top, with heart rate and battery power at the bottom. There are also app links to your profile settings and alarm notifications. You can change the X-wing fighter image by double-tapping on it. It’s a simple design, but looks cool. 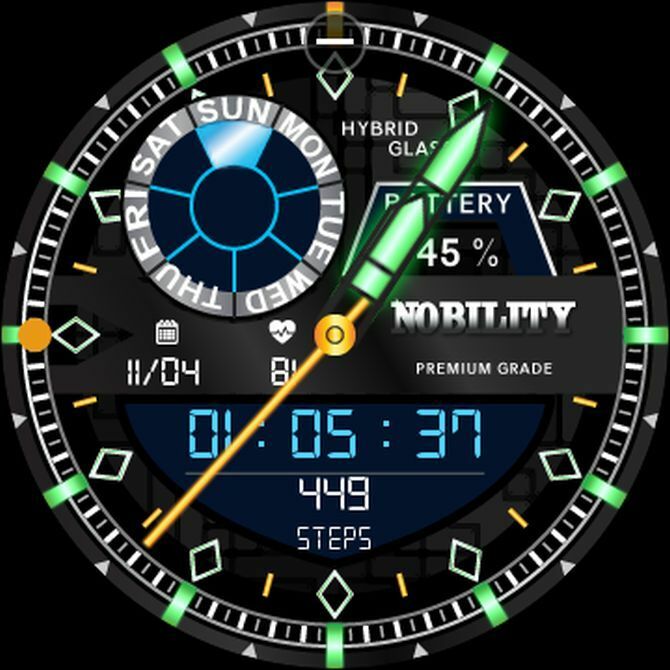 SamWatch Basic8: Space lovers, this is the watch for you. 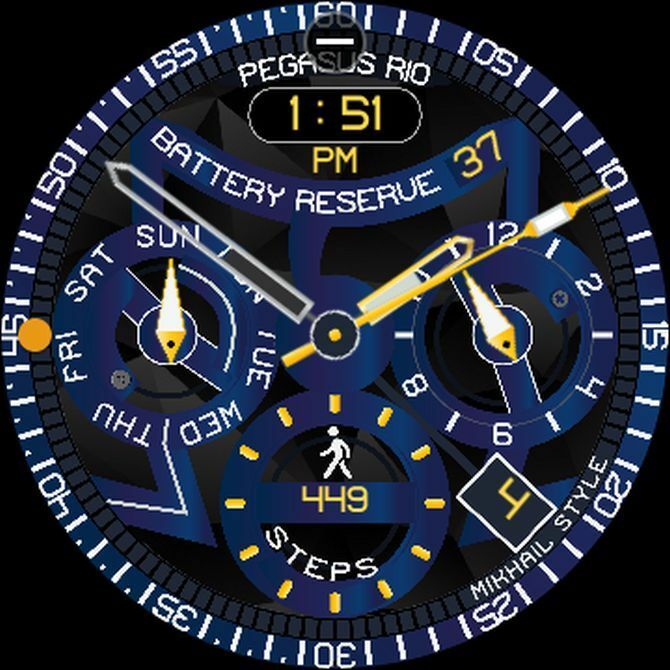 The watch displays steps to the left, weekday and month to the right, and digital time and battery power at the bottom. 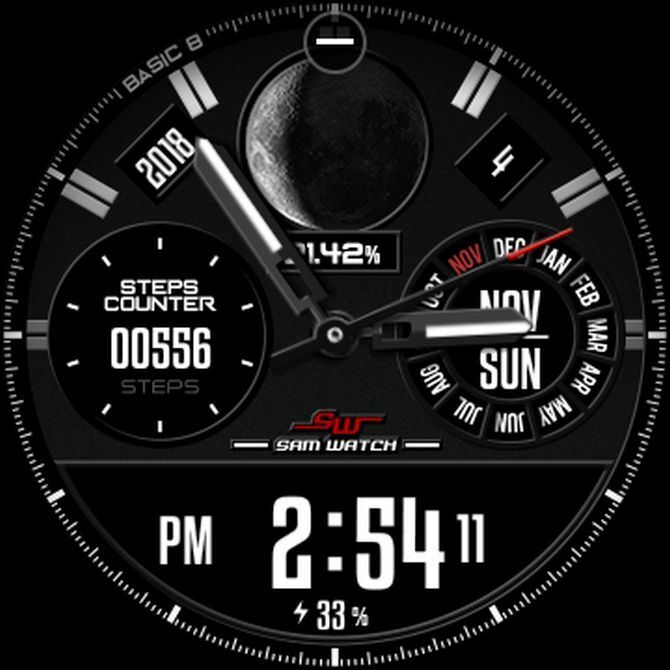 The highlight of this watch face is the moon phase displayed in both image and digital percentage at the top. 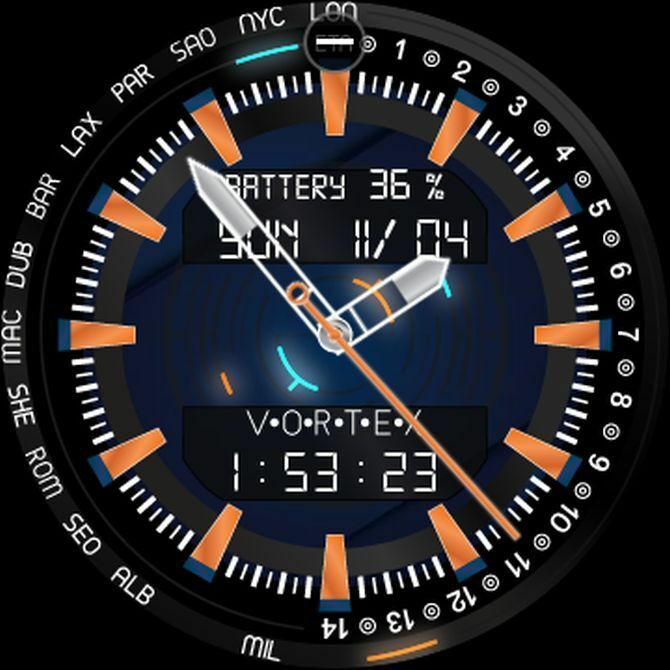 Digi-Glow 12Hr: This is one of many watch faces designed by Infinity Watchfaces. It’s a stylish, sleek design with a glowing analog dial and digital time, date, battery, steps, and heart rate display. Tap once in the center to scroll through various color and animated themes. 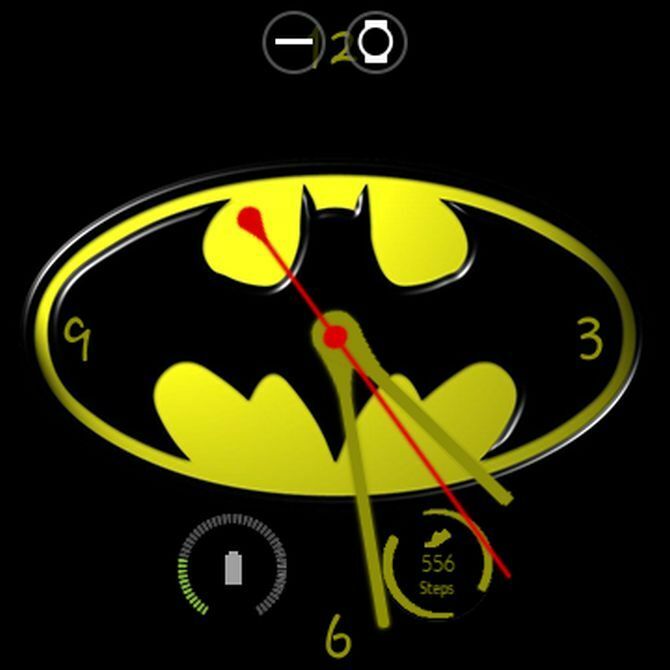 Batman black/yellow: If you want to turn heads and you’re a big Batman fan, you can’t go wrong with this watch face. 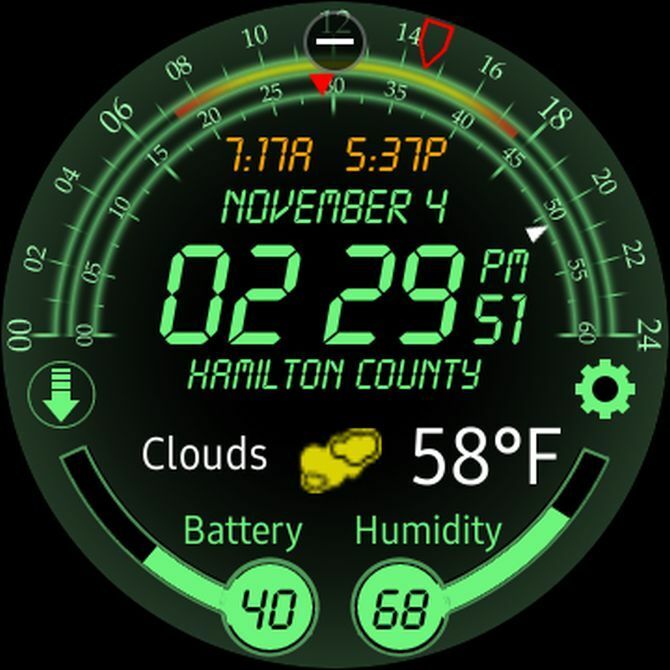 It’s a simple analog face with a battery level and steps display at the bottom. 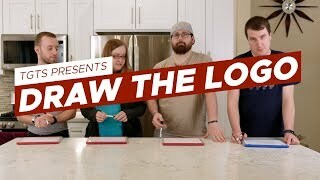 Command line: This one is for the geeks. 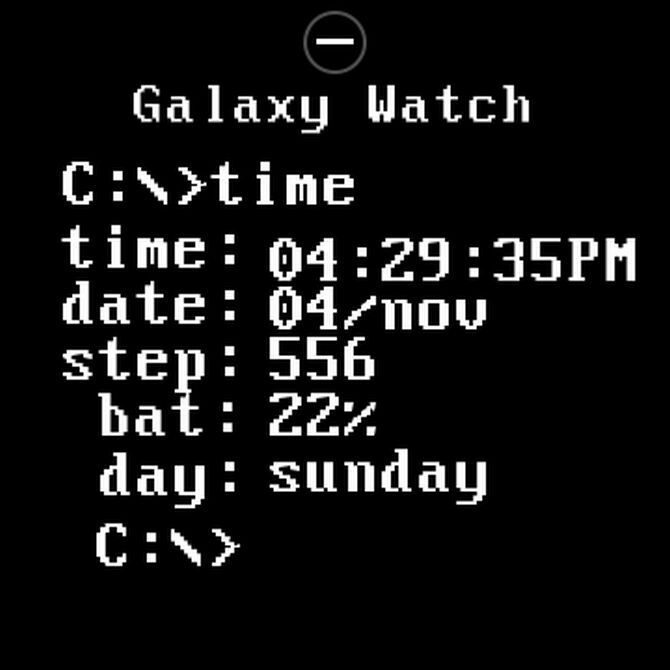 It’s an old school MS-DOS watch face that displays the date and time, steps, battery level, and weekday. You can double-tap the face to switch between a blue or black background. 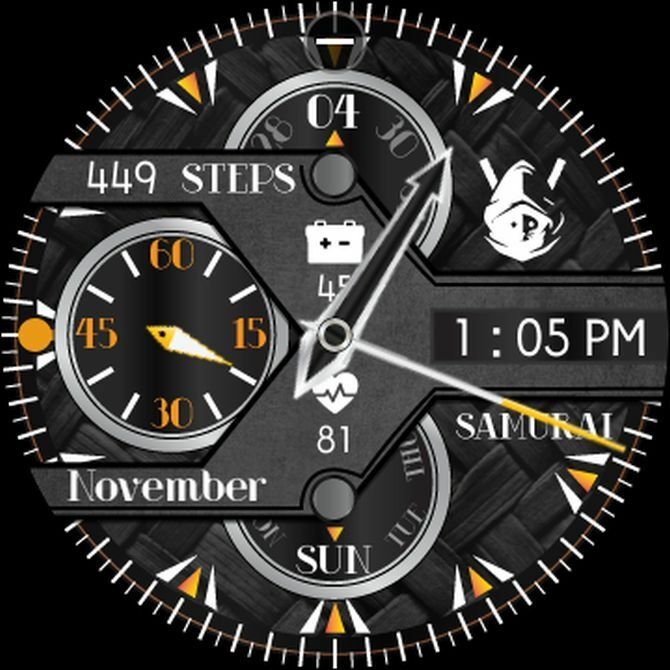 Skeleton Animated: If you like animated watch faces, this is a fun one. 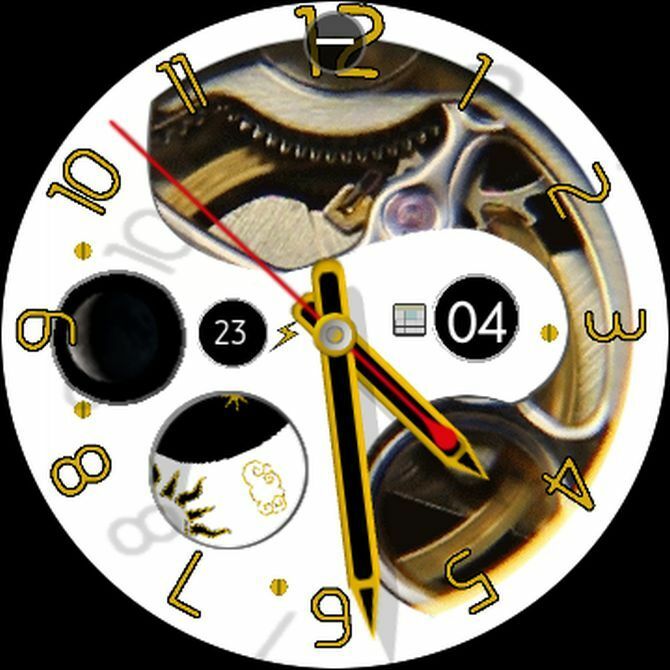 Behind the bone-white background, you’ll see animated inner workings of the watch spinning, along with the battery level and current month. Two animated indicators also show the current moon phase and weather. Zelda Day: Fans of The Legend of Zelda series The Definitive Guide to Every Game in the Legend of Zelda Series The Definitive Guide to Every Game in the Legend of Zelda Series The Legend of Zelda series is one of the most accomplished franchises in gaming. Join us as we take a survey of all the mainline series games to find out what makes them so special. 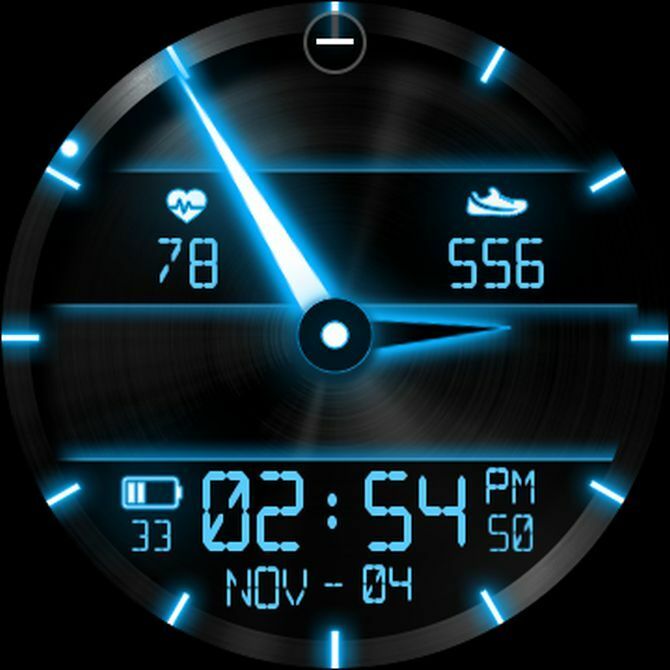 Read More will love this watch face. It’s a simple, yet stunning design. 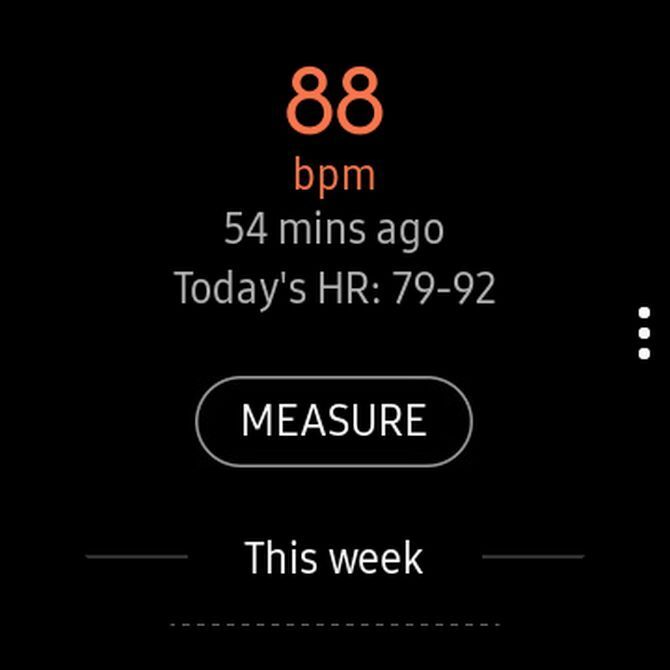 The top is a digital display of the time and date, and the bottom shows a battery indicator, heart rate, and steps. 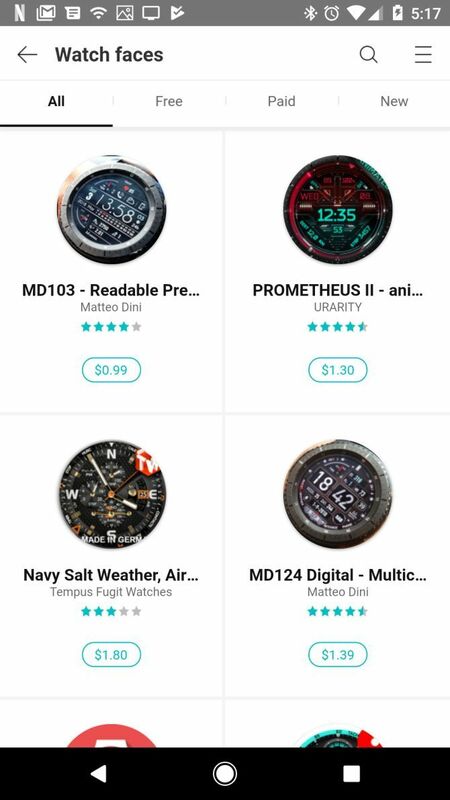 Choosing only one watch face to use on your Samsung Gear is tough, since there are so many amazing designs. 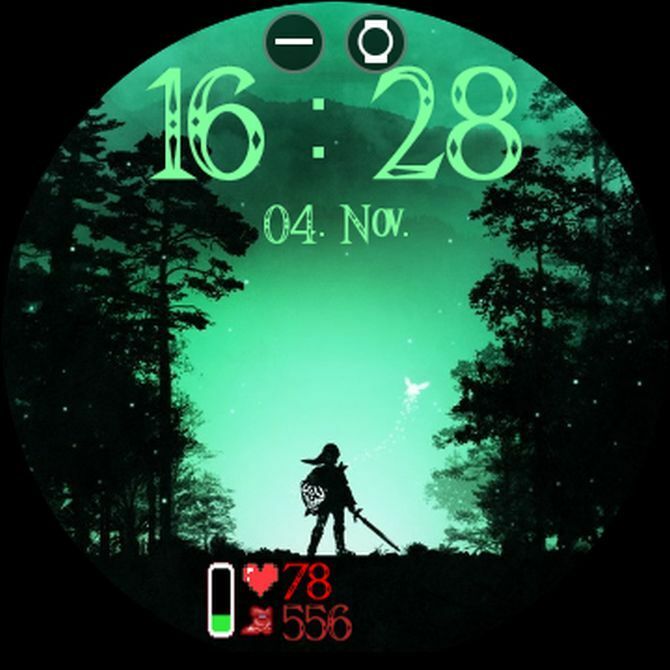 Why not download several and then change the watch face to suit your mood? 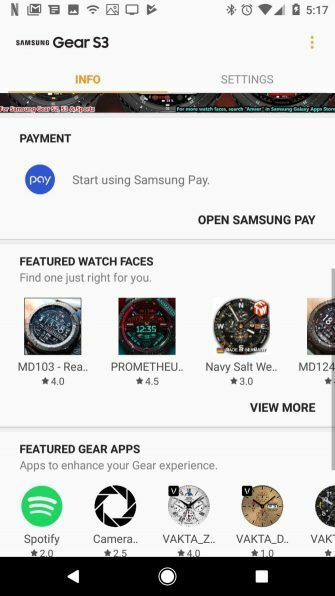 Beyond watch faces, if you’re looking to really make use of your Samsung Gear, check out some Gear apps to make you a secret agent 15 Samsung Gear Apps That'll Make You Feel Like a Secret Agent 15 Samsung Gear Apps That'll Make You Feel Like a Secret Agent Want to feel like a secret agent? 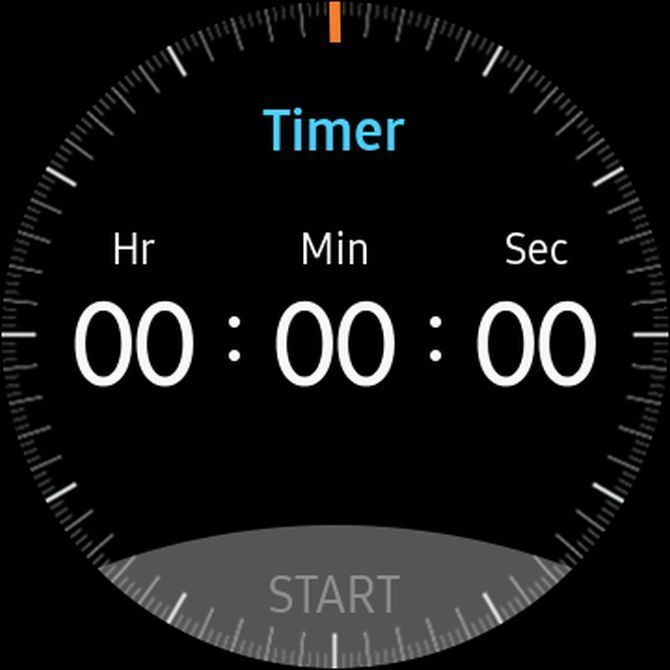 These Samsung Gear apps will make your smartwatch awesome and deadly. Read More . You’ll be surprised just how much that watch on your wrist is capable of. 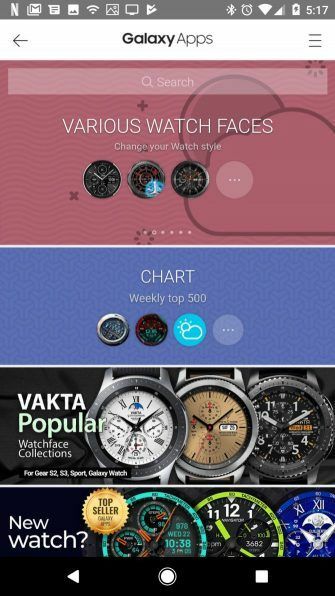 Explore more about: Android Apps, Android Wear, Samsung, Smartwatch, Wearable Technology. I was intrigued and downloaded the JK Speed 3D face...but didn't care for the 3D effect and can't see any way to disable it. There is no 'customize' option for the face - how can I turn the effect off? I hate faces with both analog and digital time. Waste of screen space. Pick one, and go with it. Use the space for a widget, or leave negative space for the components to "breathe". Nothing out there like them! there is an issue with the companion app for wm on galaxy watch. Try the Pip Boy face. Always reminds me of Fallout. 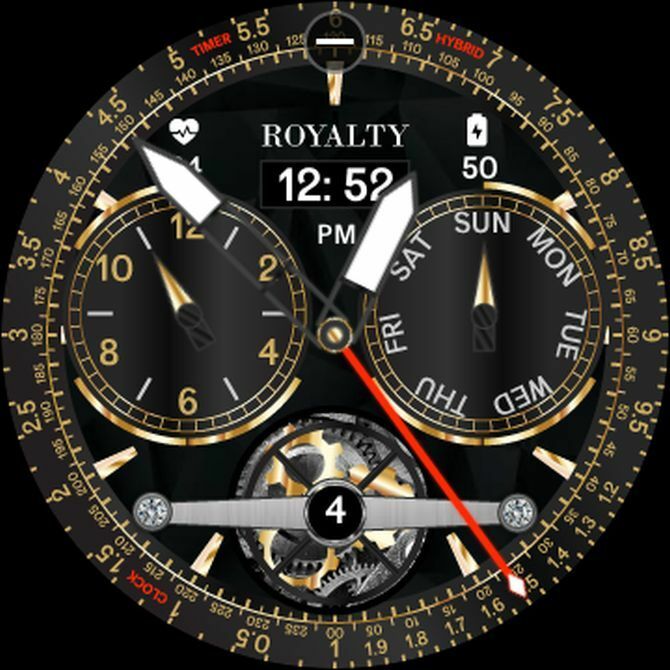 IMO Krypton is the most uniform and least exaggerated or over the top watch face.